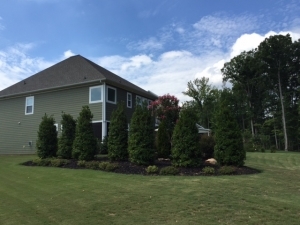 Wilsons Natural Landscaping, LLC is the proven specialist in providing large deciduous trees and screening plants. 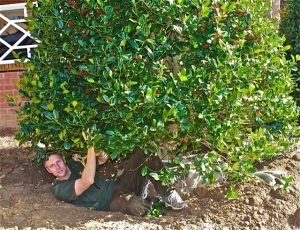 With a staff of highly trained horticulturalists and tree experts, we have the expertise needed to choose, plant, and instal the perfect tree material for your landscape. Each of our landscape designers also act as project managers for landscape installations, ensuring that the project goes according to plan. We have been providing planting and installation of large trees and evergreens throughout the North Carolina area for over 25 years. Whether we have designed your landscape plan, or you come to us with your own landscape ideas, we will always complete installation projects with the utmost care and attention to detail. Our installation process starts with the client selecting their desired plantings. Clients are encouraged to visit our nurseries to select plants that will best suit their needs and desires. Once your desired plants have been chosen, one of our landscape designers will conduct a thorough review of the plants that are already established on your property to determine whether they can be integrated into the new design or will require removal. A site evaluation will follow in order to determine all of the logistical need of the project and ensure that your installation goes smoothly. 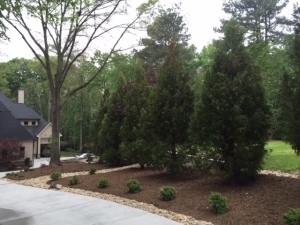 Some of the most impressive and beneficial parts of your landscape can be large trees. Trees are simply the best solution for an immediate transformation of your landscape, and can be a beautiful focal point of numerous design concepts. Creating a landscape design concept that involves large trees can be intimidating. We take the guesswork out of what trees to plant and where to plant them. 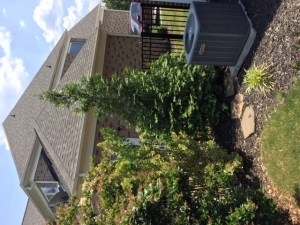 Large trees and Evergreens can add immediate, effective, and natural protection for your property. We have the knowledge and expertise to decide which tree species would serve you best, from the native, festive and classic Holly to the large and lush Arborvitae. Our team has the knowledge and skill to safely handle your investment and plant it perfectly.